This guest post is provided by Kenneth McCall, managing partner of storage.com. You don’t often hear complaints about “too much space.” Indeed, that’s the kind of problem most people would take on in a heartbeat. This “problem” takes on a whole new meaning when you consider the developing trend of people working from home or sharing work stations with others. However, a small workspace doesn’t have to mean small productivity. No matter what type of working environment you have, by implementing a few simple tips, tricks and techniques, you can ensure you are making your workspace work for you! Start out with a clean slate – literally. Nothing starts out a workplace overhaul better than a good, fresh cleaning session. Dust and disinfect all of your surfaces, clean windows and glass, and empty the trash-bins. From this point, you can see what you have to work with and decide the best course of action. Get rid of what you don’t need and then make a purposeful effort to keep clutter, junk and trash out. Keeping things separate and grouped together is essential to staying organized, which is necessary if you want to get the most out of your day and your working environment. Assign a place for everything and keep everything in its place. Carve out a moment at the end of every day to put things back where they belong and do your best not to bring things into your space that are not needed in the first place. Along with keeping clutter out, another great way to keep things organized is to keep clutter out of sight. Wherever possible, store items where they are not collecting dust and taking up valuable space. For example, a great way to create a more open feel is to get your desktop computer station in order. If possible, use a keyboard tray that tucks away under the desk when not in use. Collect all of the wires, untangle them and clamp them together with plastic clips to give a more streamlined look and clutter-free feel to your workstation. When natural lighting is not overabundant, bring some of the outdoors in by using “daylight” bulbs which mimic the lighting tone from outside. Don’t be afraid of using table and floor lamps throughout whatever space you do have to create the most open and bright feel possible. Moreover, a strategically placed mirror can do wonders to open up a space and reflect all of the area lighting you have brought in. Choose one with an ornate frame to add flare and drama to your room, a tip which also transitions us into our next trick. One of the best ways to get the most bang for your buck, as well as the most space out of your space, it to use multipurpose items that can double up on their duties. Utilize things that are not only functional, but also serve as decoration. Introduce color and design in the space while you work by using decorative containers to store your office supplies: if you lack drawers and cabinets, keep pens presentable in colorful glasses and paperclips in pretty jars. Hang a peg board on the wall and utilize hooks to hang your tools, utensils and other items that can be grouped together and dangle from the wall (color swatches, fabric samples, spools of thread, etc.). Choose a peg board in a bright and bold shade to add a pop of decorative color to the space, or in a crisp white to lend a sense of cleanliness and order to your work area. 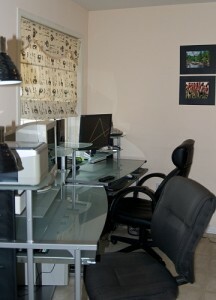 Alternatively, use a corkboard on the wall or, if hanging items is not an option (for you cubicle-dwellers out there! ), lean it up against the wall at the back of your desk or on a side table. Use decorative push pins to add style and color when you attach your notes, papers, receipts, etc. Along the same lines, use size-appropriate pieces in your space. Small-scale furniture makes a cramped corner feel more open and less oppressive. Combine the two goals by using an attractive trunk: if you work from home, you can place it in the middle of the room to function as both a coffee table and filing cabinet or storage space for books and documents. All of the design you have instituted means absolutely nothing if it doesn’t work how you need it to. Combat small-space frustration before it sets in by developing the most effective filing, shelving and calendaring systems to get the most out of any area. There are plenty of ways to utilize all aspects of your space without sacrificing function. For example, if you need one of those 2 feet-wide desktop calendars to keep all of your appointments in order but lack sufficient space on top of your desk, consider using a large, erasable whiteboard calendar and hang it on the wall. So you never waste precious time looking for erasable markers, attach one to the calendar frame with a piece of yarn or hang it from a nail in the wall and be sure to replace it when it dries out. Finally, if you can’t spread out laterally, consider moving things up and out of the way – vertical storage and floating shelves are a great way to achieve not only effective use of the space, but also draw the eye upward to create the illusion of height in a room where it may be lacking. Be sure to place items based on use: things you use less frequently should be higher while items you use on a regular or daily basis should be within easy reach. No matter your space constraints, with a bit of creativity any work station can be transformed into something that works for you. What are some of the ways you have maximized your work station? Any things you have tried that have just not worked for you or someone you know? Kenneth McCall builds creative and innovative tools for customers seeking self storage units. Kenneth is a managing partner at storage.com which provides storage units in Cincinnati and in many other locations across the country. In his spare time he likes to get outside, ideally with a boat and water skis.